Nutribios Professional truly hopes that you have a great shopping and brand experience with us like millions of customers enjoy each day. If you are trying out our products for the first time, we recommend you to take smaller units as most of our kits are available in single use / mono-dose which helps new trials. Please avoid bulk cancellations as these will involve shipping and convenience charges. If there are any external damage to the goods received by you, you are advised not to accept the shipment. Kindly informNutribios customer care and drop in an email to the support email mentioning all details within 24 hours. A replacement set of products will be shipped to you in lieu of the damaged stocks. Goods ordered incorrectly by client: In such a case, kindly inform Nutribios Customer Care and drop in an email to us. Thereafter, please send the goods back to us, along with the reorder for the same value. The to and fro courier charges need to be borne by the client. Any exchange cannot be done beyond 48 hours of goods reaching the client’s premises. Goods dispatched incorrectly: In case of a mis-match of products or an unlikely oversight on our part, we will ship the correct set of goods to you and the mis-matched set shall be picked up at no additional cost to the customer. Any other reason for the cancellation or return shall be handled case to case basis. 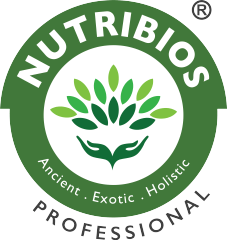 Nutribios Professional does not warrant and shall not be responsible for the damage arising out of the use of the products listed on its site. If a product delivered to you is different than as described on the website, Nutribios is liable only to change the product and cannot be held responsible for delays arising out of force majeure. You are advised to do patch test on the skin to determine the suitability and start using the product.